When Cally Fisher sees her dead mother, real as anything, no one believes her. So Cally stops talking - what′s the point if no one is listening? The only other living soul who sees Cally′s mum is a mysterious wolfhound who always seems to be there when her mum appears. But without a voice, how will Cally convince anyone that her mum is still with them, and how will she ever persuade her Dad that the huge silver-grey dog is their last link with her? There's a quote from Cathy Cassidy on the front of this book 'Heartbreakingly beautiful...I loved it', I could just leave it at that, because those are my thoughts precisely. Once again I am in awe of another first time author. What amazes me is that these authors have been out there living their lives doing other things, in the case of Sarah Lean, teacher/gardener/stencil maker to name a few, and then out pops a beautiful story like this one! The story is about a family of 3, Cally Louise Fisher age 11, Luke Fisher age 13 and their Dad. One year ago Cally's Mum died, on the day of her Dad's birthday. Cally doesn't miss her like she did in the beginning, but what she really wants is to talk about her Mum, with her Dad, so that she can remember her. This is not something he can do. On the 1st anniversary of her death Cally sees her Mum in the graveyard, waring her red raincoat, walking along the wall. The next time she sees her she is with a great big dog. No one believes that Cally can see her Mum, but the dog is most definitely real, and it keeps turning up wherever Cally is. When volunteering to take part in a sponsored charity event, where she has to be silent for the 6 hour school day, Cally doesn't realise where this will lead. Cally stops talking, for 31 days, she doesn't say a word. When the family have to sell their house and move into a flat we meet Mrs Cooper and her son Sam, who live in the same building. 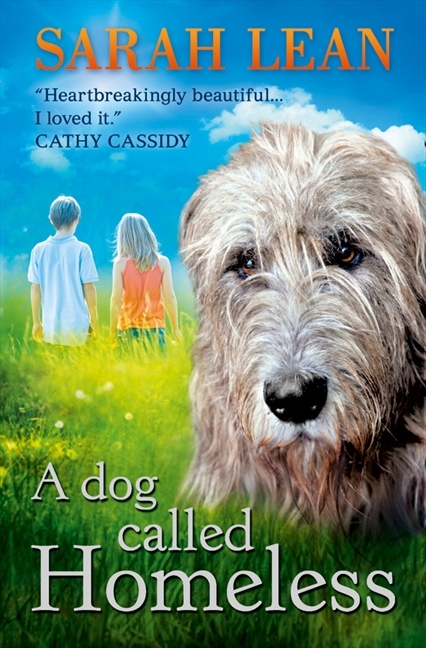 Sam is blind and deaf, and with Cally not speaking, their friendship is an interesting one. It's just a lovely book, about grief and loss, but also about the importance of remembering. The characters are interesting and colourful, like Jed the homeless man who seems to own the big grey dog and who Cally thinks can see her Mum too. The friendship between Cally and Sam is beautiful and even though he can't hear or see, he is the one who knows Cally best. The age recommendation on the back of the book says 9+. The text is quite spaced out and there are pencil illustrations scattered through the book. It's difficult to put an age on it because although it's simple and easy to read, it's quite a 'big' story that makes you think, and if you're a softie like me, might have you grabbing for the tissues! Here's a link to a dedicated website that has an excerpt, more information about the issues talked about in the book, and teaching resources to download.